You know the saying... "A picture is worth a thousand words." And it’s especially true when it comes to photos of your Miniature Schnauzer. 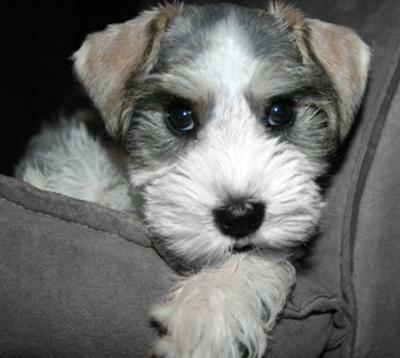 Schnauzers have the most adorable mannerisms and facial expressions. They entertain us with silly antics and are just ate-up with cuteness. No wonder why we as owners want to take tons of pictures of them, right? But taking great pictures of your furry friend isn't always so easy to do. After all, I'm sure your Mini Schnauzer is far more interested in chasing squirrels then sitting pretty for the camera. So what’s a pet parent to do? Below find great photography tips on taking a picture perfect photo of your dog. Here are 7 invaluable pet photography tips that will help you capture pictures of your Miniature Schnauzer worth framing. 1. 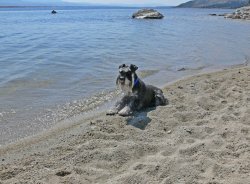 Know Your Dog - You know your Mini Schnauzer better than anyone else: his funny habits, moods, likes, dislikes… so use this info when choosing the time and place to photograph your dog. Don't just try and get your dog to sit pretty for a picture. Take shots of your Schnauzer at a park, or when he's gazing out the window, or while resting in his favorite sunny spot or when he pops up from under the bed sheets. If you are going for a more posed picture, just be patient and remember to never force your Miniature Schnauzer to remain in a pose or wear uncomfortable clothing etc.. just in order to get a picture. This is especially true when you first begin taking pictures of your dog. 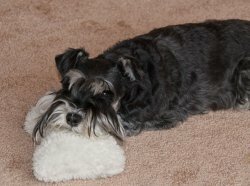 Allow your Schnauzer to have some fun while you practice taking pictures of him. Just take lots and lots of pics. Take pictures of your dog during play time, while he's napping or when he's gnawing on his favorite chew toy. It will be good practice for both of you. As you learn about angles, lighting, and taking action shots of your dog, your Miniature Schnauzer is learning not to fear the camera, and this is important in helping you get a great photo of your dog. 2. Go Digital – Invest a little money into a digital camera it's well worth it. And you can buy a digital camera for less than $100. The benefits of using a digital camera are many but most importantly, you don't have to wait for your film to be developed before seeing if you got the perfect shot. Camera Tips: Although digital cameras have almost made traditional film cameras obsolete, if you are using the later, make sure you have plenty of film on hand when taking photos of your pet. On the other hand, if you are using a digital camera, make sure the batteries are charged and there's enough space on the memory card. 3. Be Camera Ready – You never know when your Miniature Schnauzer is going to do something amazing or absolutely adorable, so try to always be prepared. Have your camera in a handy location so you can get to it 'in a flash' and not miss the moment! Be sure to take your camera with you on trips, hikes, visits to the dog park, and even when you're out in the back yard just playing around with your dog. And if you don't have your camera handy, remember to use your cell phone. Most all cell phone are capable of taking some pretty good pictures today. 4. Natural Light is Best – You will take some beautiful Miniature Schnauzer pictures in natural light. Whether you're outside or inside (just open your curtains or blinds) taking pictures with natural light offers lots of benefits. Pictures taken in natural light always appear softer and prevent "red-eye" (or in this case, "blue-eye") from occurring in your Miniature Schnauzer's pictures. Also for most dogs, once they experience the camera flash, they'll refuse to ever look into the camera again. So if you don't have to use the flash – don't. Your Miniature Schnauzer will eventually learn to be comfortable with the camera and give you lots of adorable expressions. 5. Get Close & Get Down - The 2 biggest mistakes people make when taking pictures of their dog are: 1) too much background in the photo and 2) the photo taken at the wrong angle. To get a great Miniature Schnauzer picture, get as much of your dog in the picture as possible and get down on your dog's level. You might get a little dirty but hey, you'll get a great photo! dog photography tip: If you want to include some background scenery that's okay. Just make sure there are no unwanted items in your frame before you take the picture. Someone sneezing in the background, dangling wires, or a dirty clothes hamper can really ruin what could have been a great picture. Also, keep a handful of tiny treats, in your pocket, to encourage your Miniature Schnauzer to perform for you, as well. 7. Brag About It – Now that you have a nice collection of Miniature Schnauzer pictures, why not show them off? You could put together a dog scrapbook, have your favorite Schnauzer photo turned into a fun piece of art in the form of a pet caricature. You can even make personalized gifts or greeting cards. The possibilities are endless! You can email family & friends your photos, post them on social media sites and of course show them off by entering our Schnauzer photo contest, too! Who knows? You might just have taken that winning photo! So there you have it. You now know what to do to get some great pictures of your dog. So what are you waiting for? 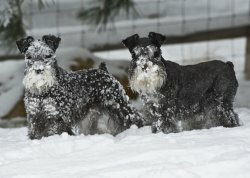 Check out these Miniature Schnauzer pictures submitted by our site visitors. Schnauzers Rule - Got Schnauzer? 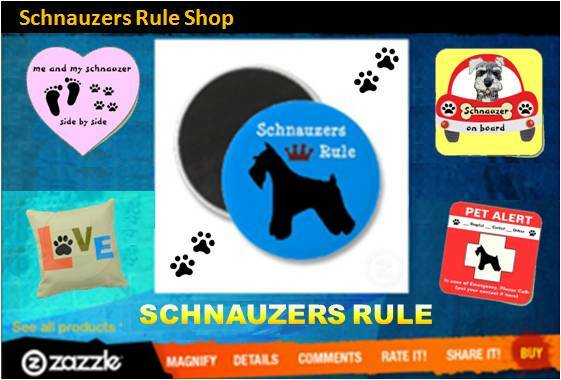 You can create great gift items using your Miniature Schnauzer's photos thanks to our partner site: Zazzle.